I am getting a little bored with the whole “let’s say nasty things about the Catholic church” thing that our culture seems to have going on these last few years. 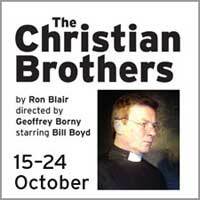 Being an older play, Ron Blair’s The Christian Brothers doesn’t suffer from the same simplistic and one-dimensional depiction of Catholicism as its more modern counterparts. It’s refreshing. This one-man play is about an ageing Catholic school teacher going through something of a crisis of faith in the strangely public context of his classroom. Perhaps the most interesting part of this play is how the classroom itself, while occupied by however many students the audience imagines to be there, can be at once public and private. Veteran of the Canberra stage, Bill Boyd brings the flawed teacher to life brilliantly, eliciting empathy and laughter as we recognise those flaws that most of our teachers probably also had. This is a great production, and an hour well spent.